Today, my current Elf collection has become HUGE...I've become addicted to this brand and to its products. I wouldn't expect such a good quality at such convenient prices! As you know there are two different methods to get your goodies delivered at home: "international signed-for" and "standard shipping" I've always used the first one, to avoid any package loss etc, and I've used the second one only once...What can I say about them? Great!!! I've always received the package after a maximum of 7 working days, always perfectly packaged! But service doesn't mean just delivery...It also means assistance for the customers who need it. Fortunately I've never had any kind of problem with my orders, but I've got in touch with the customer service a few times: they're kind and answer to any problem in a few hours. It's the best online customer service I've experienced till now. Ad oggi la mia collezione Elf è drammaticamente cresciuta, in maniera esponenziale direi. Sono diventata Elf-dipendente! xD La prima volta che ordinai non mi sarei mai aspettata una qualità cosi buona a prezzi cosi onesti e convenienti! Come saprete ci sono due diversi metodi di pagamento: con raccomandata (signed-for) e standard. Ho sempre usato il primo per sicurezza, tranne una sola volta...e il pacco mi è sempre arrivato in non più di 7 giorni lavorativi intatto e ben confezionato! Ma servizio non significa solo consegna dei pacchi in uno stato decente, significa anche assistenza clienti. Non ho mai avuto nessun problema con gli ordini, ma ho avuto la possibilità di contattare il servizio clienti per informazioni un paio di volte: sono seri, disponibili, gentili e rispondono alle email in poco tempo. E' il servizio clienti online migliore con cui abbia mai trattato fino ad oggi! In a few words: quality & great prices! Elf products are amazingly good if compared to their price! You can find almost anything you need, from brushes to lip glosses, from bronzers to eyeshadows...their range is so wide! In poche parole: qualità e prezzi ottimi! I prodotti Elf sono incredibilmente buoni se comparati al loro prezzo! Si può trovare qualsiasi cosa si voglia, dai pennelli ai gloss, dai bronzer agli ombretti...La loro linea di prodotti è cosi vasta! Elf has never disappointed me till now and I'm sure they won't in the future! 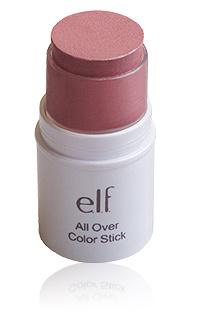 - All over Color Stick: this product is so versatile! These are a few products among the wide range! I've just found them great, so this is a personal opinion. La Elf non mi ha mai delusa fino ad ora e son sicura che non lo farà nel futuro! E proprio perchè la loro linea di prodotti è cosi vasta, ne ho scelti alcuni, a cui potreste dare un'occhiata se siete nuovi a questa marca. - All over color Stick: un prodotto cosi versatile! What is your experience with Elf? What products would you suggest? Let me know! I love elf! I'll place another order soon! I agree they have the best customer service ever! Prompt replies and politeness! I have only tried their "tools" and primers so far, but I plan on ordering some mineral lipsticks, and the infamous mineral booster, and brush cleanser. have you tried them? any advice? Yes, I've tried the mineral lipsticks... I have very dry lips and they keep them well moisturized, moreover they're also very pigmented! I've got Party pink and Rosy tan, very natural shades! Mineral booster is very nice too, although I prefer the mineral glow, because mineral booster has a hint of pink in it and I don't like the effect on my pale skin! xD The brush cleansers are great! Much better than the MAC one! (which I also have) I've tried both of them and I prefer the smaller one (not the daily but the other I don't remember its name LOL) it works great! I haven't tried the face primer because I've read it's silicone based and I wasn't sure to try it or not.